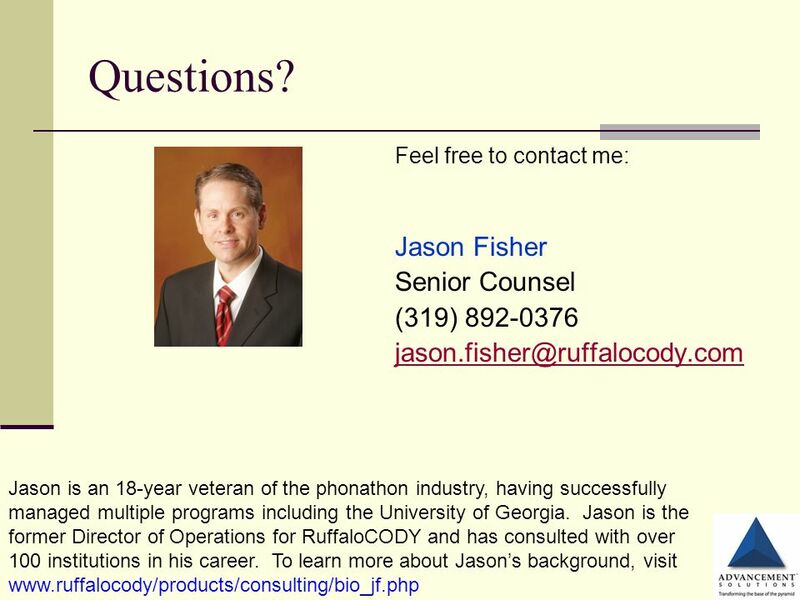 Using Phonathon to Positively Influence Matching Gift Programs …Tips and Strategies for Increasing Results Jason Fisher, Senior Counsel Advancement Solutions. 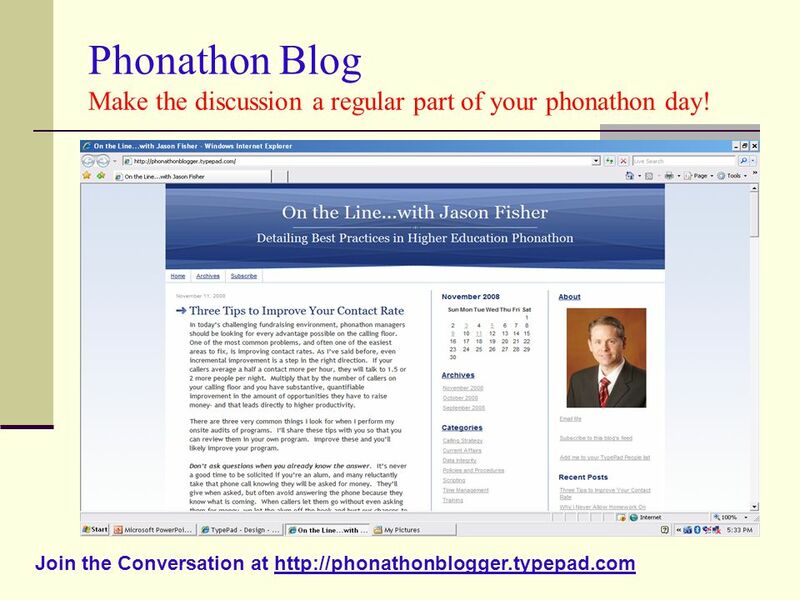 3 Phonathon Blog Make the discussion a regular part of your phonathon day! 4 Would You Turn Down Free Money? 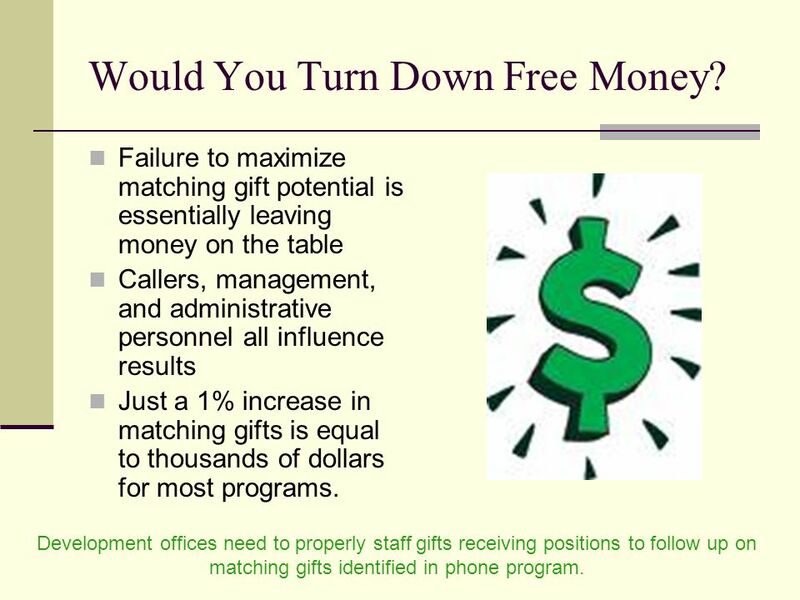 Failure to maximize matching gift potential is essentially leaving money on the table Callers, management, and administrative personnel all influence results Just a 1% increase in matching gifts is equal to thousands of dollars for most programs. 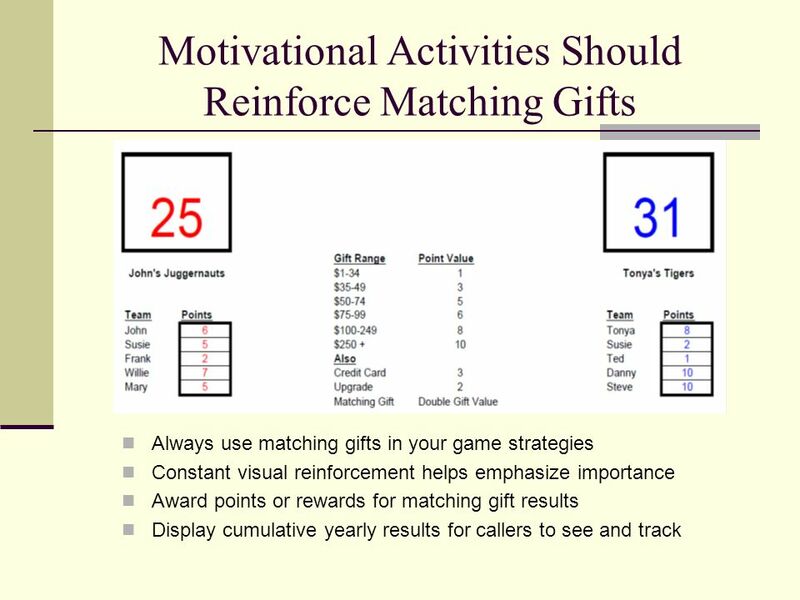 Development offices need to properly staff gifts receiving positions to follow up on matching gifts identified in phone program. 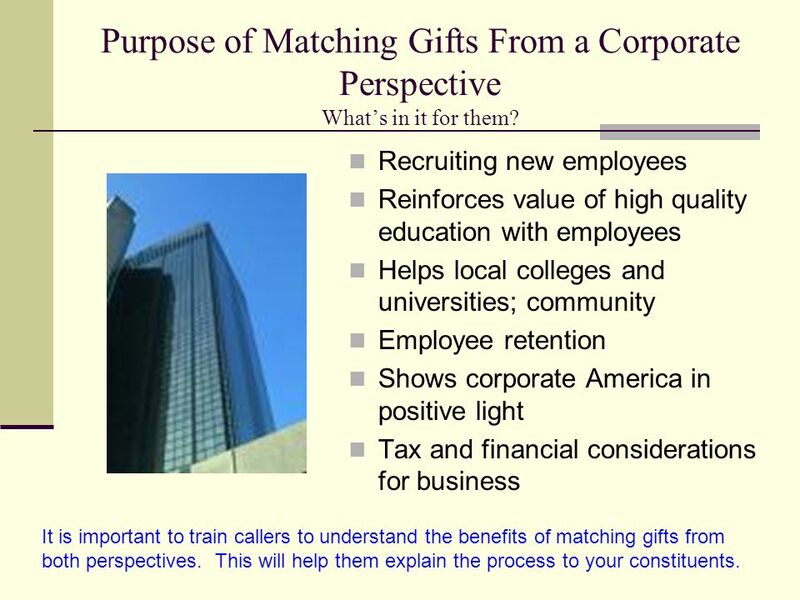 5 Purpose of Matching Gifts From a Corporate Perspective What’s in it for them? Recruiting new employees Reinforces value of high quality education with employees Helps local colleges and universities; community Employee retention Shows corporate America in positive light Tax and financial considerations for business It is important to train callers to understand the benefits of matching gifts from both perspectives. This will help them explain the process to your constituents. 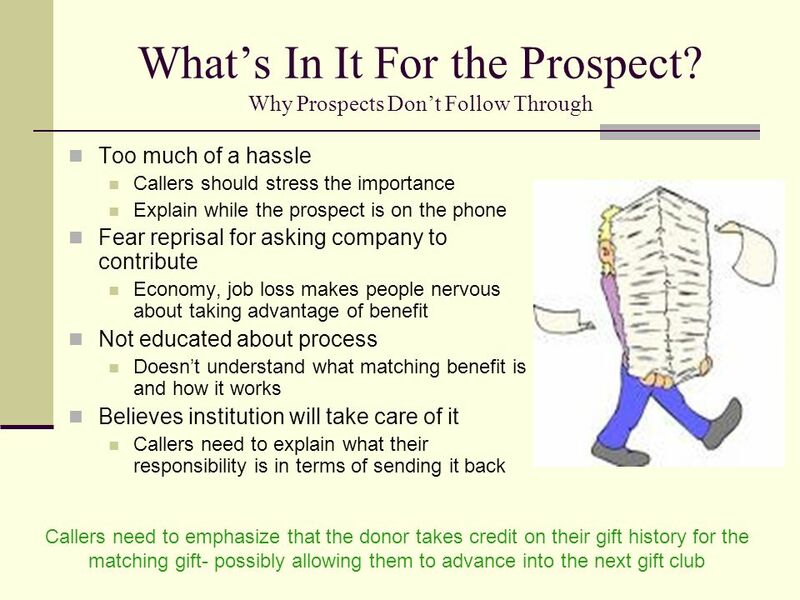 Callers should be able to explain outline of process to prospect General steps involved College/university’s role in processing Credit recognized/given by school Devote a full page in your training manual to matching gifts Cover how to distinguish company rules, including minimum and maximum amounts, retiree or spouse matches, match ratios, etc. 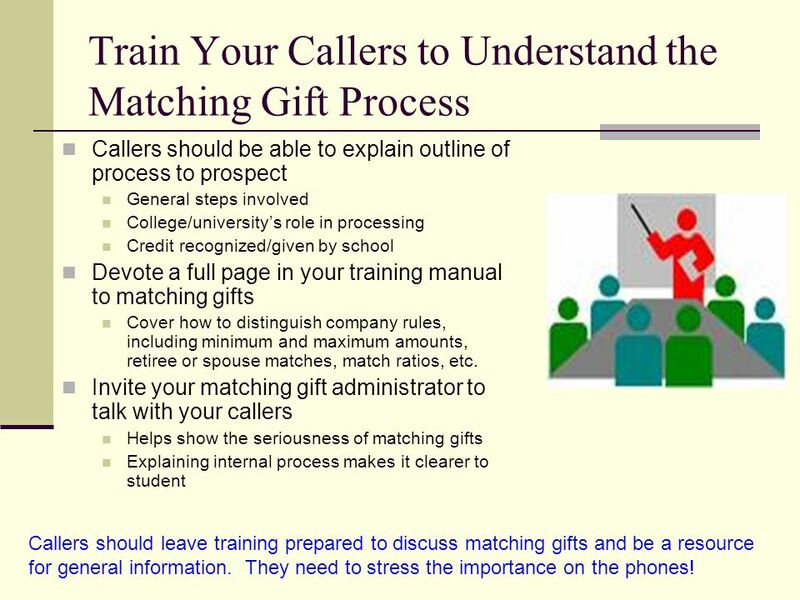 Invite your matching gift administrator to talk with your callers Helps show the seriousness of matching gifts Explaining internal process makes it clearer to student Callers should leave training prepared to discuss matching gifts and be a resource for general information. They need to stress the importance on the phones! 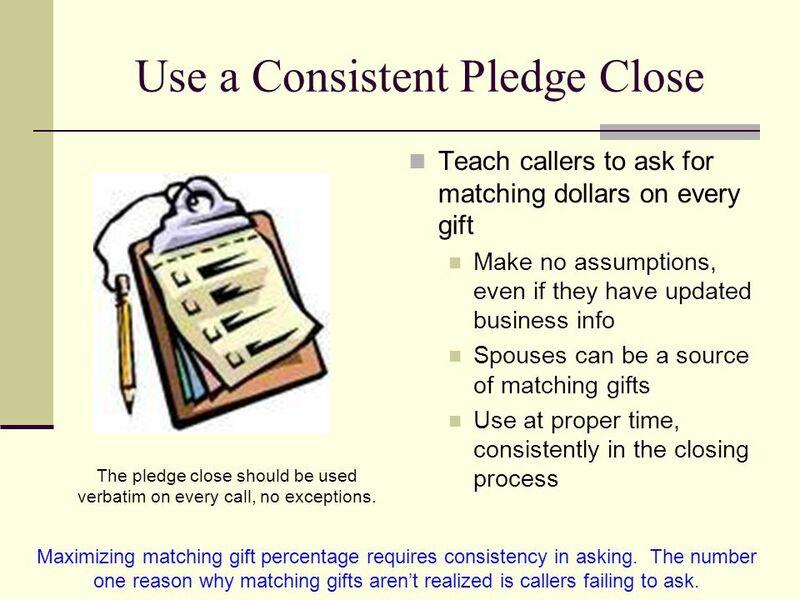 Teach callers to ask for matching dollars on every gift Make no assumptions, even if they have updated business info Spouses can be a source of matching gifts Use at proper time, consistently in the closing process The pledge close should be used verbatim on every call, no exceptions. 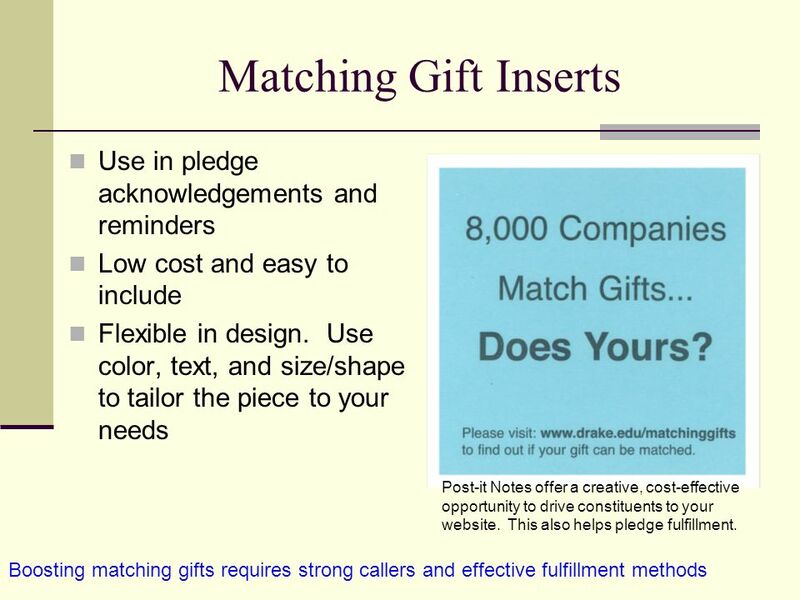 Maximizing matching gift percentage requires consistency in asking. 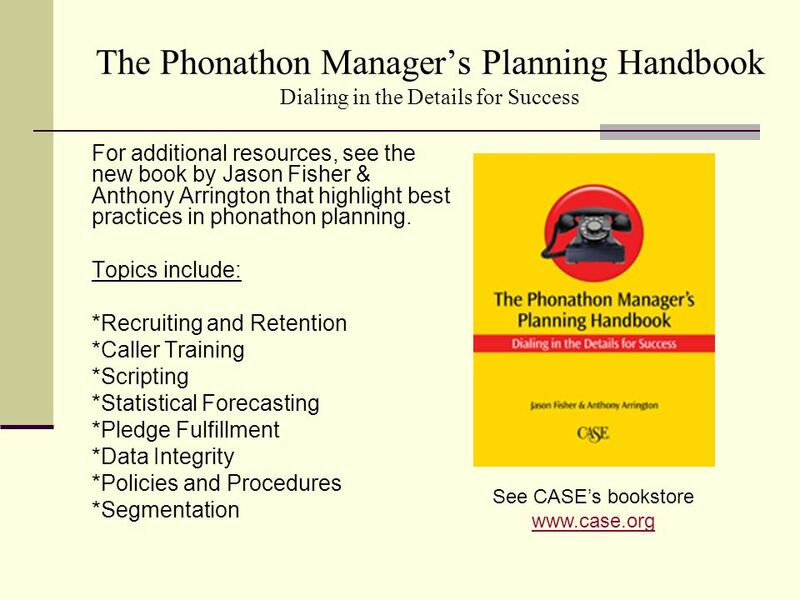 The number one reason why matching gifts aren’t realized is callers failing to ask. Close if Pledge (READ ALL POINTS VERBATIM) Thank you very much for your commitment of $_____. Will that be on your MasterCard, VISA, American Express, or Discover? (Be very assumptive with this sentence) If they object to using credit card: The reason we are asking all alumni to place their gift on a credit card this evening is that it saves the College postage and administrative costs. Giving on credit card actually makes your gift even more valuable to the school. Can we put that on your MasterCard, Visa, American Express, or Discover card this evening? (If No): We will send you a pledge card in the mail. Can you have that gift back within 30 days? Is your mailing address still ________? (If no, capture new address) Are you still employed at __________? 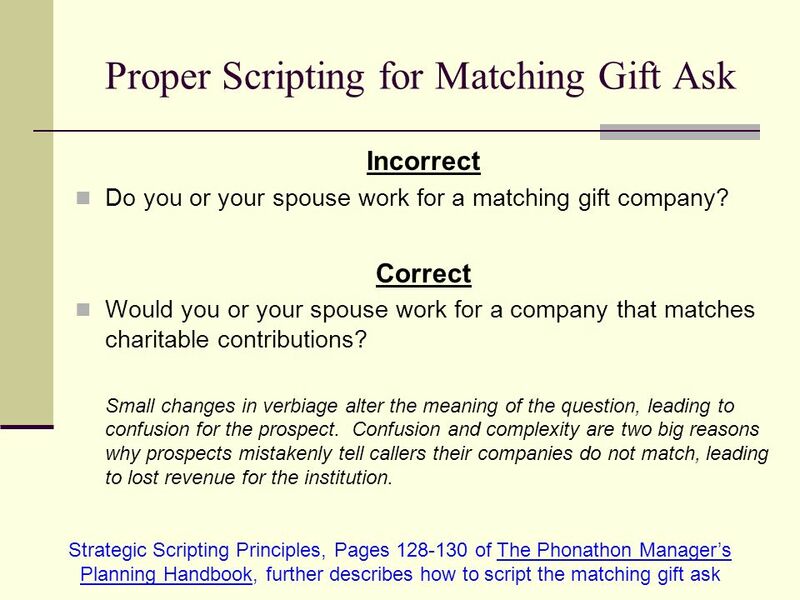 (If no, or employer field is blank, capture employer) Would you or your spouse work for a company that would match your gift? 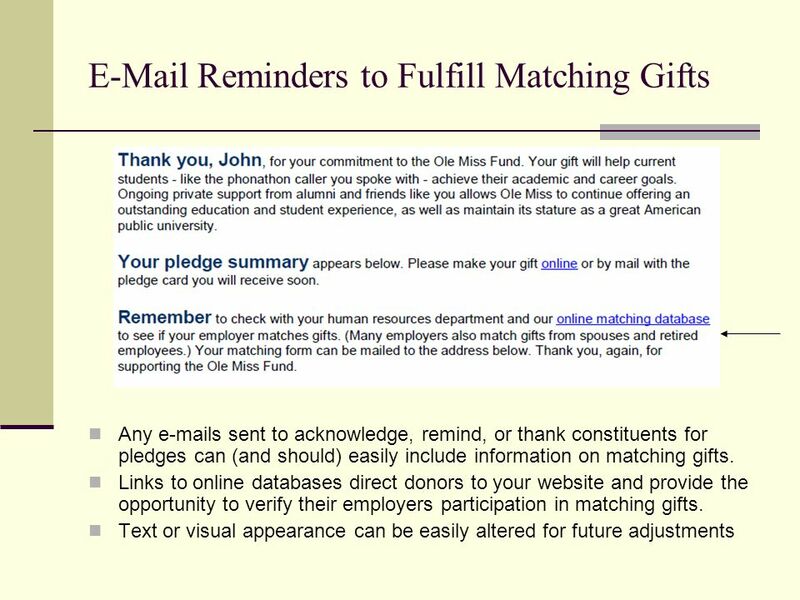 (Offer to look up their employer on our matching gift list). This can in some cases double or even triple support to Spring Hill College. Be sure to explain the process to prospect. Thank you for your commitment of $_____. I enjoyed speaking with you and appreciate your support! 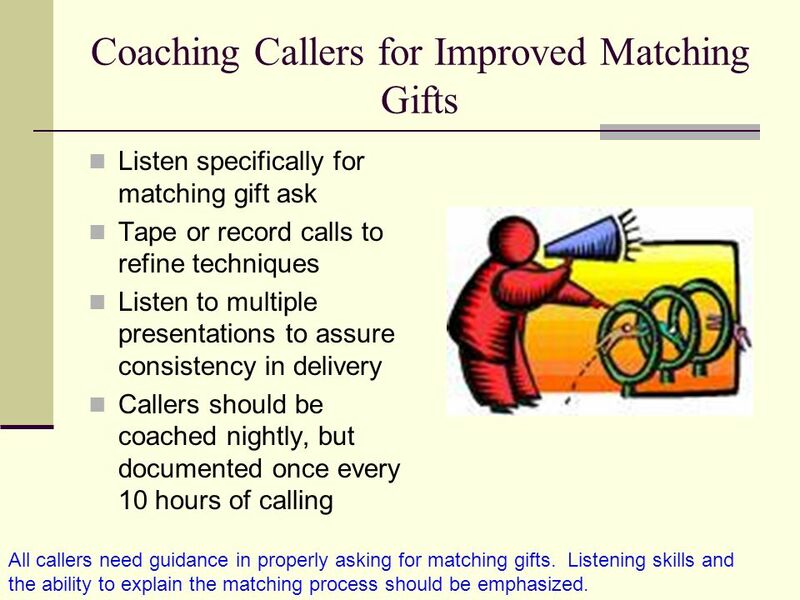 Listen specifically for matching gift ask Tape or record calls to refine techniques Listen to multiple presentations to assure consistency in delivery Callers should be coached nightly, but documented once every 10 hours of calling All callers need guidance in properly asking for matching gifts. Listening skills and the ability to explain the matching process should be emphasized. Averages are affected by: Institution Predominant employer in town Types of degrees offered Donor education Student callers Scripting and training Programs typically average 5-10% of all pledges and dollars from matching, depending on the above factors. Results less than 5% are cause for further investigation. Check individual caller statistics to ensure they are consistent with team average. Phrase correctly for maximum effectiveness Stated too bluntly and many prospects refuse to update Use early in the call as part of demographic update process Helps justify the reason for the phone call Ask for job title along with company name Phone number is bonus Example Business information (employer and title). The University likes to hear what alumni are doing with their degrees. [Are you still working at…?] [Would you mind sharing your title and employer name?] 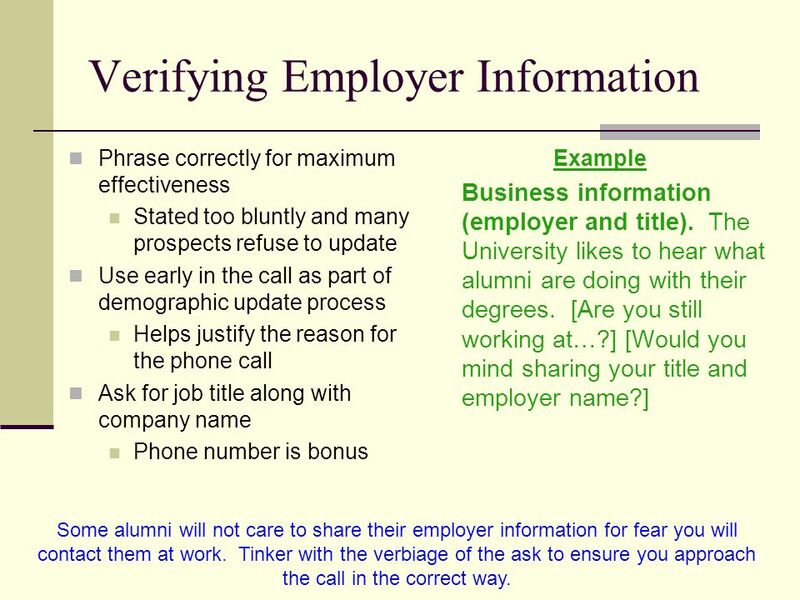 Some alumni will not care to share their employer information for fear you will contact them at work. Tinker with the verbiage of the ask to ensure you approach the call in the correct way. 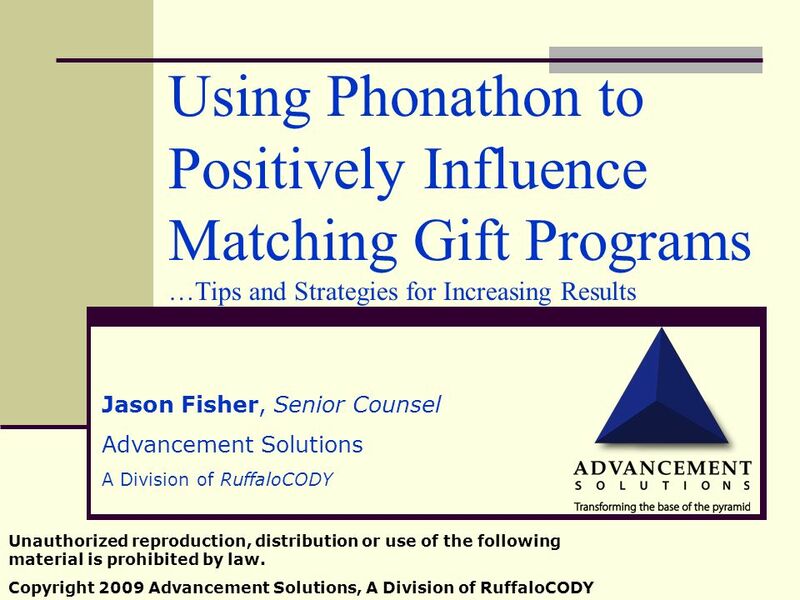 Download ppt "Using Phonathon to Positively Influence Matching Gift Programs …Tips and Strategies for Increasing Results Jason Fisher, Senior Counsel Advancement Solutions." Using Phonathon to Positively Influence Matching Gift Programs Tips and Strategies for Increasing Results Mike Brucek Director of Services Fundraising. Our Pledge I/We pledge $________________ $___________ is enclosed now. I/we will send the balance of $__________ by May 31, Apply my gift to: Area. Career Center Job Fair $uccess Norman S. Stahl, Ph.D. Director, UH Hilo Career Services Press Left Mouse Button to Advance Slides. Juniors and Parents Night II Mike Squarcia Director of Guidance Voorhees High School. HEP Development Educational Series Wednesday, July 1, 2009, p.m. Presenter: Gail A. Ferris Director, Development Services The Catholic University. ‘ Technology that manages your people with you’ Copyright Townhouse Consulting Ltd The Absence Management System. 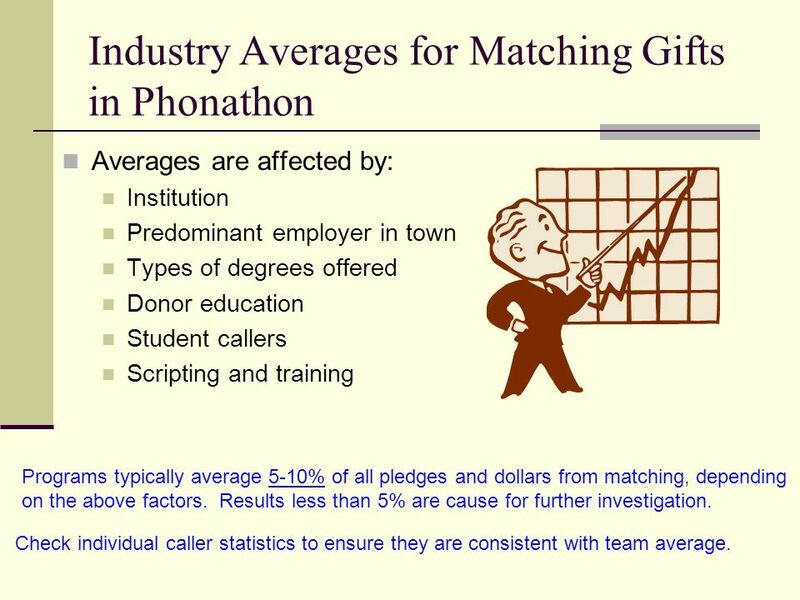 Using Phonathon to Positively Influence Matching Gift Programs Tips and Strategies for Increasing Results Mike Brucek Director of Services & Lead Consultant.